ANAHEIM, Calif. – It was 15 minutes after the final buzzer sounded and Josh Perkins climbed his way up to the podium for the postgame press conference. His eyes were red and puffy, and his head hung lower than usual after Gonzaga lost to Texas Tech 75-69 in the Elite Eight on Saturday. For the redshirt senior, this would be the final time he would speak to the media about his teammates, his family. College athletics are unique in that no matter what, players are done when their eligibility runs out. There’s no free agency or no future comeback. Some make it five or six years if their medical redshirts allow them to, but most players lace it up for four years or less and move on to their next adventure. For seniors Perkins, Jeremy Jones and Geno Crandall, each took a unique path to Gonzaga, each spent a different amount of time in Spokane, but each left their mark on a program that puts family above all. Perkins was technically recruited out of Huntington, West Virginia, but the redshirt senior guard called the Denver neighborhood of Park Hill home. The four-star guard had 20 offers on his table, including Arizona, Baylor and Kansas. He chose to come to Gonzaga, and his legacy is one that can’t be questioned, even if he has some harsh critics. After passing Matt Santangelo in career assists at Gonzaga earlier this season, Perkins passed Silas Melson in NCAA Tournament games played with 16 (Melson is second with 14). He also is one of 11 Zags to scored 100 points in tourney games. With 134 career wins, he is three behind former teammate Przemek Karnowski’s record of 137. Yet Perkins still has been under fire about his game and his antics. Perkins’ time in Spokane wasn’t always rosy, though. Jones had an interesting route, earning a scholarship to play football at Rice University, following the route of his dad and brother. But basketball continued to draw him in and he ended up walking on at Rice, starting two games for the Owls in 2014. Jones decided to transfer after his freshman season. He came to Gonzaga with one of the best transfer classes that GU has had, including Johnathan Williams and Nigel Williams-Goss. After playing sparingly over two seasons, Jones played himself into a role similar to what Mike Hart played for GU. Jones played strong defense, hustled for loose balls and provided valuable minutes to a team short on bodies early on this season. He also is one of four current Zags who was active during GU’s Final Four run two seasons ago. The plan is for everyone to stay in touch. If the 2017 Final Four team is any indication, that hope will be the reality. “Like the Final Four team I was on, we just talked the other day in a group chat, and I feel like this group will be the same,” Jones said. Crandall’s story was one that started with questions marks as the season drew near. No one was quite sure when he would play. His graduate transfer status from the University of North Dakota was up in the air, as his classes were transferring poorly and his summer classes were still in progress. But he finally practiced in mid-October. After a few weeks of acclimating himself with the Zags and dealing with a broken hand, he became a vital cog of a seven- to eight-man rotation. His fiery demeanor and sticky defense added an important element to a Bulldogs team that was lacking defensive intensity. Crandall said it best when it comes to the legacy of this class. 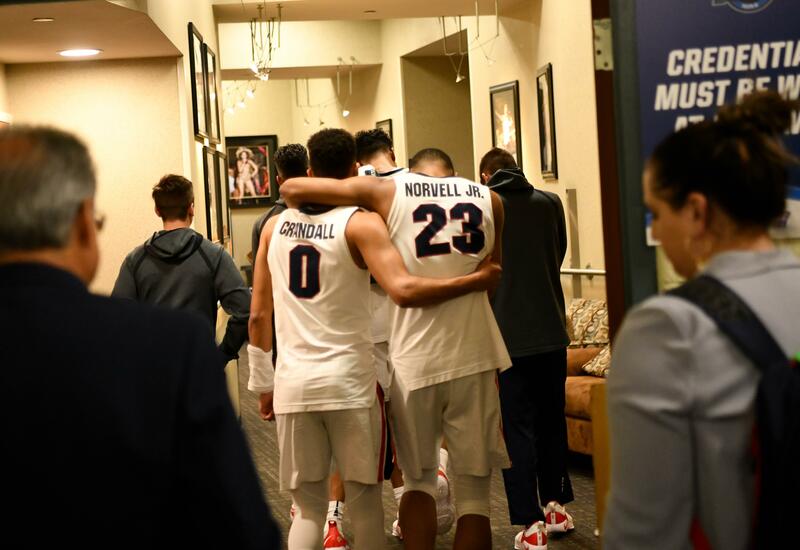 “We always talk about the Zag way and the Zag standard, and when you think about the senior class, they raised the level of what the Zags standard will be moving forward,” Crandall said. When the loss to the Red Raiders starts to fade, the seniors will have their memories – but that’s all they are now, memories. Published: March 30, 2019, 8:43 p.m. Updated: March 30, 2019, 9:25 p.m.